A real mixed bag of results for Galway Clinic sponsored community club Maree/Oranmore fc. The Junior adult Premier side played very well on Sunday last in South Park and enjoyed a dominant second half position but were edged out 2-1 by West Utd in a really close game with Neil Greaney netting. Manager Don O Riordan was very happy with his charges effort and commitment after the game. The Junior Adult reserve team which fielded 3 u21 club players will be happy with a 4-3 win against Merlin Woods fc/Medtonic in Oranmore last Saturday with the goals arriving from Jason Spellman, Rob Mangan(2) and Steve Matthews in an overall good performance. Four of our u12 teams were in action last Saturday. The u12A side (pictured) advanced in the u12 Connacht Cup after a fine 4-0 victory away to St Josephs fc in Athlone with the goals arriving from Harry Gilbert, Jack Raftery, Jack Leahy and David Mc Laughlin. 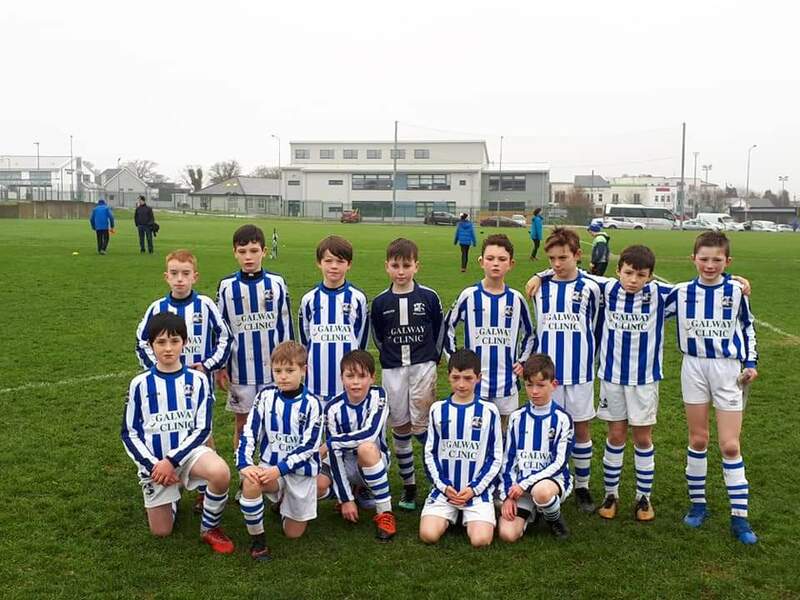 The u12 division 1 side pictured below, made up of u11A side battled superbly but went down 3-1 after extra time against Colga fc in the u12 Connacht Cup in Oranmore on Saturday last with Barry Keating scoring. The u12 div 4 side played a thrilling game in Doughuisce against our friends in Merlin Woods fc on Saturday last and came out the wrong side of a 5-4 thriller with Noah Dowling getting three and Oisin Roberts also netting. A game played in great spirit by both sides in honest endeavour. The u14 div 2 side gave top Sligo club Strand Celtic a bit of a scare in the u14 Connacht Cup with an impressive second half display in Strandhill but were edged out 3-2 with Tom Griffin and Damola Ahieide getting the goals. The U14A side will look forward to the sfai u14 cup game v Merville Utd in Oranmore this Sunday but they will be disappointed as they exited the Connacht U14 Cup away to a strong Westport Utd outfit. The u16 Connacht Cup game fell foul to a waterlogged pitch in Oranmore following torrential downpours. The u12 championship team traveled to Loughrea for a League game and came away with an excellent 6-2 victory against the local Loughrea Rams side. This was a very competitive game and enjoyable to watch with the side captained by Brian Conneely with the scorers being Daragh Mill(2), Alexander Szoska, Cian Quirke, Ruairi Fallon and Conneely himself. A special mention to stand in keeper Caelan Coleman who excelled between the posts. A good weekend for our girls sides kindly assisted by Oran Precast, the U16 Girls defeated Corrib Rangers 4-1 in the League in Westside on Sunday morning last with a brace from Roise Mc Mahon and goals from Nicole Duffy and Aisling Quinn. The u12 girls had a fine 3-0 victory against Knocknacarra fc B with a brace from Emer Brosnahan and an og doing the damage for Pat Costellos side. The weather played spoilsport for the St Columbas C.U Invitational Tournament last Sunday. The Christmas Schedule will be as follows, the last Saturday of Training (Christmas Party) will be Saturday 15th December with the Academy returning on Saturday 12th January 2019 after a well earned break. The November Cash Prize winners of our Club Members Development Draw were as follows; 1st prize Hayden Simpson, 2nd prize Bobby Charles and Third prize went to Martin Joyce. Thanks to all who support our members draw to assist in the construction of a new 4g playing pitch for our young people. Details from Fergus Kelliher on 087 2457626. Well done to club players Dara Cleary, Colm Whelan, Conor Daly, Michael Burke, Daniel Keady, Alan Greene and Daragh O Connor who were involved in Inter League games over the weekend. Remember our Football For All Programme continues every Saturday from 4pm to 5pm in the Maree Basketball Hall.